Sarah Dollard’s Doctor Who story, Face the Raven, can be summarised simply. Ashildr returns, tricks the Doctor into wearing a teleport bracelet and in so-doing Clara takes one risk too many. Clara ends up dead and the Doctor is teleported away as Ashildr wonders just what she has done. I’d been puzzled over the return of Rigsy, that made sense once revealed and the character may have been a bit passive but that’s a thought I’ve had while writing this, I wasn’t conscious of it at the time. The trap street is a nice idea, even if it needs a proper ecosystem behind it to be sustainable. Nice little glimpses of various aliens, trying to go about their business. Instead of technology we had the worms and it al felt very distinctive. I accused it of being Diagon Alley before; I still stand by that though would like the setting expanded. This of course brings us to Ashildr. For me the character had a game of two halves: first imperious and wonderfully realised by Maisie Williams; second half weaker, reserved, flustered and not as natural a performance. Great ideas with the shadow/ quantum raven killer though. Did we all notice at no point did we find out who Ashildr was working for? The mystery was simplistic, and had to make room for the rest of the episode. A couple of quick interviews, chat to the daughter and all figured out. The Doctor didn’t try to use the sonic to rid himself of the teleport and seems content to take risks. Sarah Dollard may be new to Who but is a skilled writer (Neighbours, Merlin, Being Human, Primeval, The Game…) and the setting well conceived even if a lot of the airtime was spent in getting there with much TARDIS overflying and wandering around being weird. Many of the characters were simplistic, but we had to wonder about the back story of the aliens, how they live and what they had done to end up there. So, Clara Oswald joins Katarina, Sara Kingdom, Adric and Rory in the ranks of those companions who died on screen. If you call Osgood a companion and the Zygon version lived then she too is on this list. Moffat and Jenna Coleman herself are all clear this is the end (even for the impossible girl who still appears in a diner in the final episode somehow) and there will be no random resurrection (Rory, Jenny Flint, Jenny and sort-of Osgood. Oh, and Captain Jack!) this time round. There’s always audio! In case it isn’t clear, I like this. I can pick holes, and I am sure others can. 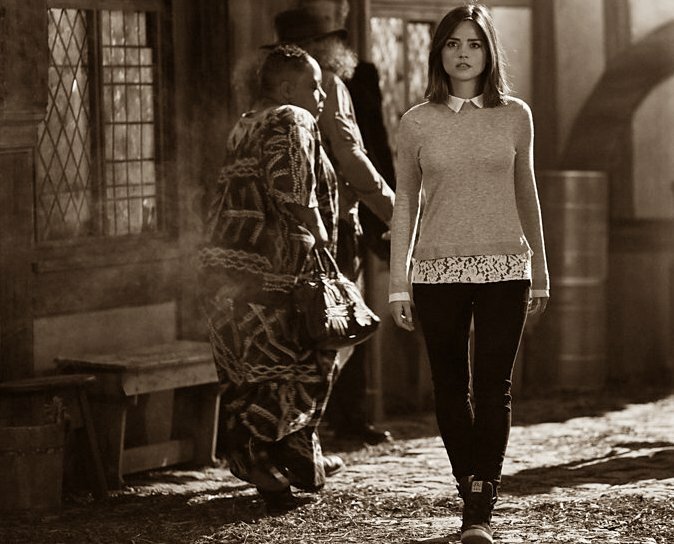 It had emotional impact, even though Clara’s death was well teased. Accomplished stuff.